Hillsong's Naked Cowboy is Back -- Except Now it's Naked Santa! 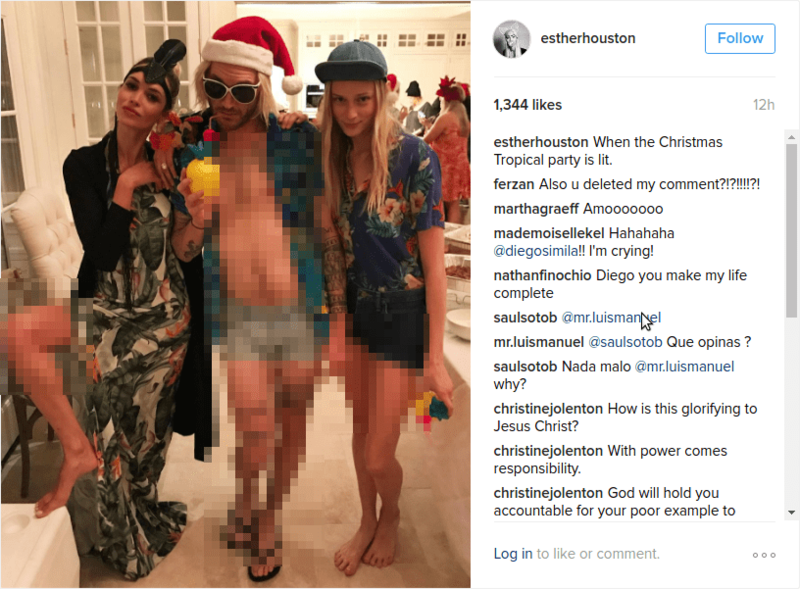 On Esther Houston’s (wife of NYC Worship Leader, Joel Houston) Instagram site (click with caution), you’ll find the following festival of flesh. This comes as no surprise since Hillsong is known for its debauchery and trashy performances, watered down gospel, and compromise on nearly everything Christians stand for. Several weeks ago, Joel Houston, son of Hillsong CEO, Brian Houston, posted on Twitter that he found Jen Hatmaker’s affirmation of gay marriage “refreshing.” In 2015, the same NY-based branch of Hillsong put on what many dubbed Hillsong’s Sleazy Silent Night, where a woman was paraded on stage in a seductive manner wearing provocative clothing. Carl Lentz, lead pastor of Hillsong NYC, was recently interviewed on Oprah’s television show where Lentz denied that you must be a Christian to have a relationship with Jesus Christ. Lentz’ church also had two openly gay members of his congregation serving in the choir–one as the choir director. Hillsong isn’t a church. Michael Brown says that this is simply an “exaggerated picture of the church of America.” But sadly, this is not exaggerated. This is commonplace and is quickly becoming the mainstream. The true church in America is the minority. It’s time the true church separate completely from the world and Hillsong.